We all encounter both challenges and joys in our lives and this year was no different. As hopeful humans, we commit to doing what it takes to stay positive and enjoy the gifts each day brings. Among the New Year's good luck traditions of eating greens (for the prosperity of folded money), legumes (resembling coins) and noodles (for long life) are round or ring-shaped cakes for a sweet full circle, the cycle of life. In some cultures, the first piece is made as an offering to a saint and subsequent slices are served in order of age. Sometimes there's a small token hidden for extra good luck to the finder. So today I'm offering you a round cake in the hope you may enjoy a lovely year full of goodness and light and the very best of good luck in 2016. As we turn the page into the 2016 winter season, I’m drawn to the fabulous trio of nuts, spice and chocolate. And although I tend to go with almonds and pecans most of the time, I do love toasted walnuts in pastries and desserts. California just happens to produce about 99% of the nation’s walnuts so they're readily available here. Rich in plant-based omega-3, walnuts have a unique flavor all their own. 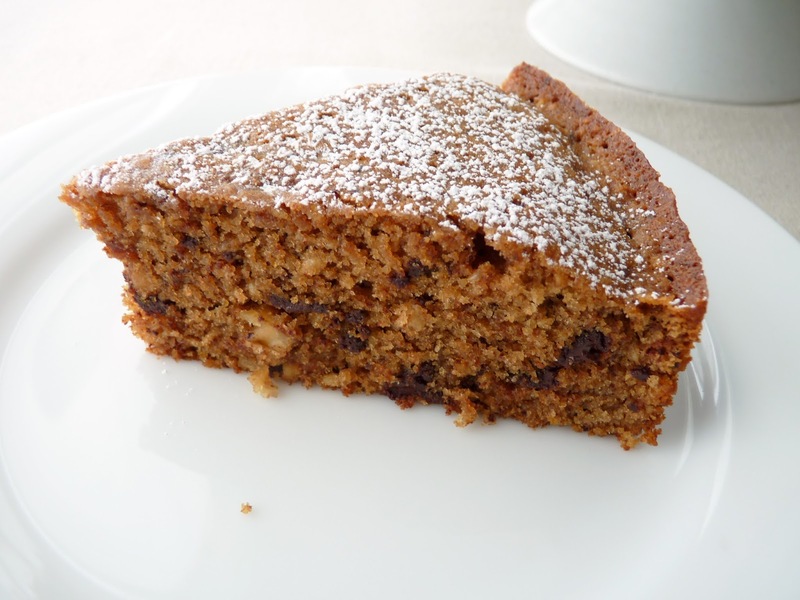 In this Walnut Tweed Cake, I combine toasted walnuts with the complimentary flavors of instant espresso powder, cardamom and chopped chocolate. 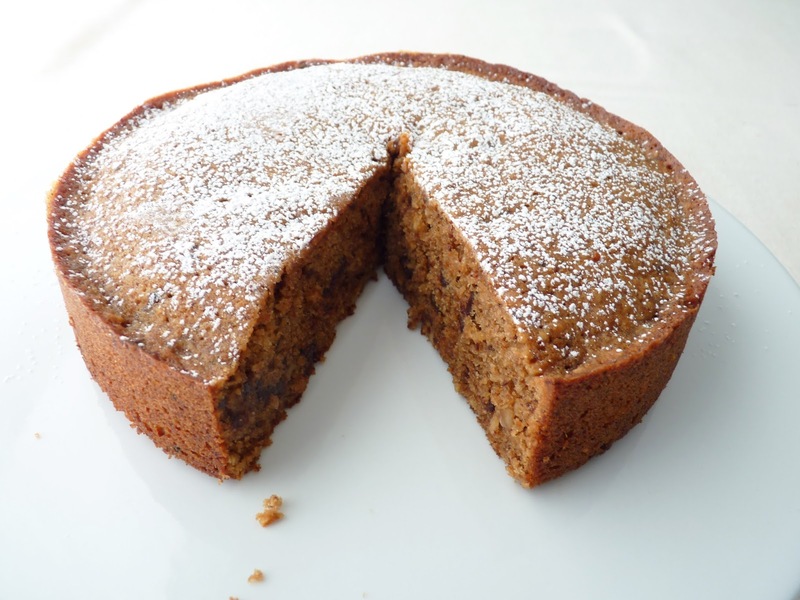 The cake is fairly light and subtle rather than rich or heavy. When slicing into this simple rustic cake, it reminded me of the look of a warm fall tweed, just the sort of thing to ward off the chill of winter. It has woven into its texture the comforting elements of simple and pure ingredients. I do recommend as the winter seeps into our bones that you enjoy a nice slice with a good cup of hot coffee whenver the mood strikes for a cherished moment of life's luxury. Here’s wishing everyone a very HAPPY NEW YEAR!! 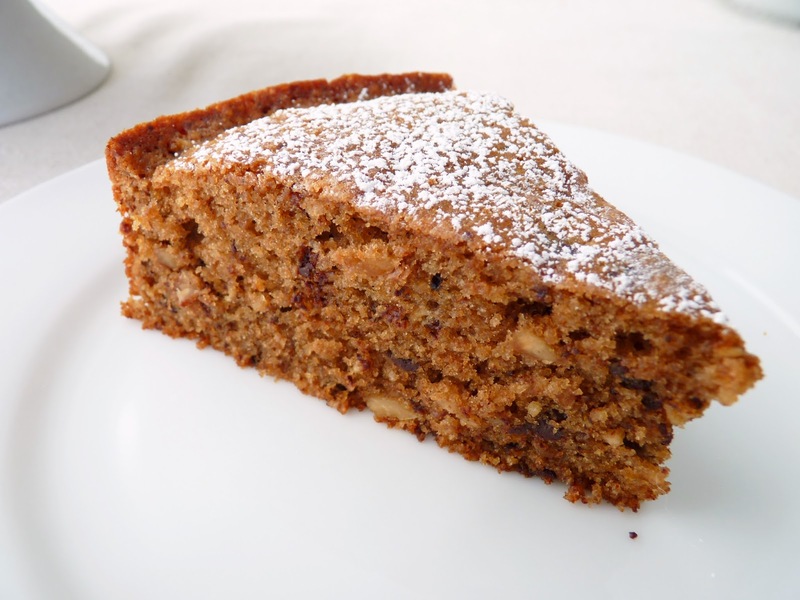 - Toasting walnuts brings out their full flavor and adds significantly to the cake. Put the nuts in a single layer on a baking sheet in a 350 degree F oven for 10 - 15 minutes. Cool. - Room temperature butter is not oily or soft. It should give just a bit when you press into the surface. - Add the espresso powder to the milk and vanilla when the milk has warmed up to room temperature so it will more easily dissolve. - Because there is a small amount each of flour and ground nuts, it’s important to take the time cream the butter and sugars properly on medium speed until light and fluffy; add eggs one at a time, mixing thoroughly before adding the next (the batter is ready for the next egg when it no longer has a shiny slick on the surface); and then thoroughly combining with the flour and nut mixture to build a solid structure. Scraping down the bowl at each juncture really makes a difference. - Chop the chocolate and remaining walnuts into fairly small pieces (about the size of chocolate chips) so they don’t sink to the bottom. - For another seasonal walnut cake, try Walnut Maple Cake. Preheat oven to 350 degrees F. Lightly grease and flour an 8” x 2” round cake pan and line the bottom with a round of parchment paper. Place 3/4 cup (3 oz) toasted walnuts, flour, baking powder, salt and cardamom in the bowl of a food processor. Process until the walnuts are finely ground. Pour into a bowl and set aside. Whisk together the milk, vanilla and instant espresso powder and set aside. Coarsely chop the remaining 1/4 cup (1 oz) walnuts and chocolate into small pieces and set aside. Cream the butter and both sugars until pale and fluffy, about 4 minutes. Add eggs and egg yolk one at a time, fully incorporating each into the mixture before adding the next and stopping to thoroughly scrape down the bowl after each addition. Slowly add the flour in three additions, alternating with the half the milk mixture and beginning and ending with the flour. Mix until the batter is completely combined. Use a rubber spatula to fold in the remaining 1/4 cup chopped nuts and chocolate. Pour the cake batter into the prepared pan and spread it evenly. Bake until a tester comes out clean, about 32 - 33 minutes. Let the cake rest for 10 minutes. Gently run a thin bladed knife around the edge of the pan and invert the cake. Remove the parchment and invert the cake again. Cool completely. Dust with powdered sugar.